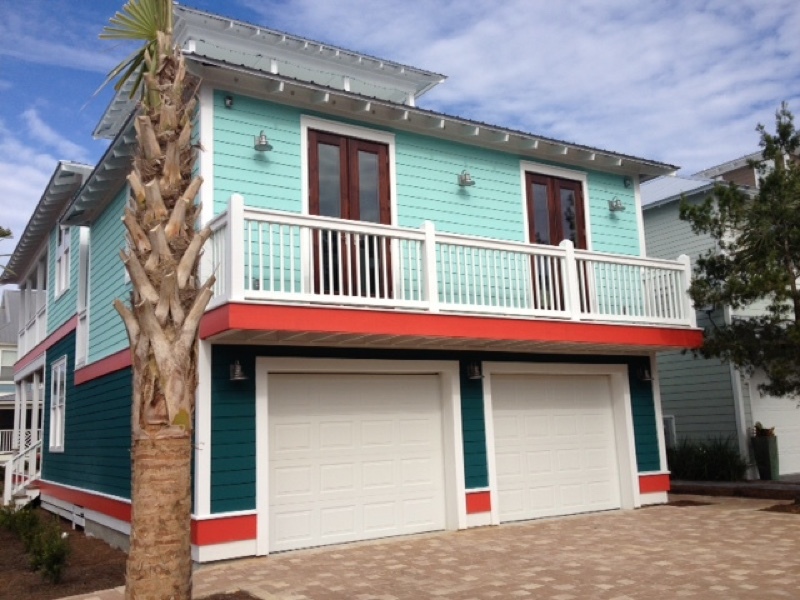 Stay in this fabulous Carriage House located in the center of North Seacrest Beach. One will find delightful beachy décor in this one bedroom unit featuring a king bed with high quality linens. In the separate living room there is a sofa sleeper which will allow space for an additional two guests. The unit features a full kitchen with stainless appliances (fridge with ice maker, stove with microwave, and dishwasher), granite countertops, and custom cabinets. Enjoy gourmet coffee with Keurig beverage service (coffee pods included)! Enjoy the refreshing Gulf breezes from two sets of French doors opening from the bedroom and living area. The balcony provides a great view over this quaint neighborhood. Unwind and relax in the jetted tub featured in the large spa-like bathroom. Just a short walk away is the 12,000 square foot pool or stroll down the tree-lined path in Sunset Beach to access the fabulous Gulf of Mexico. From March through October, both the pool and beach can be accessed using the complimentary tram service picking up patrons at their doorstep. Within easy walking distance one can enjoy quaint restaurants and shops as well as nightly entertainment at Peddlers’ Pavilion at the Village of Seacrest. Located between Alys Beach and Rosemary Beach, one can enjoy more unique shops and dining as well as movies and concerts. Amenities for guest use include a fully stocked kitchen including basic pantry items, as well as full-sized washer and dryer (supplies included). Enjoy biking through the neighborhood and on the many trails with the complimentary adult and children’s bikes found in the garage (bike trailer for tots included, too). Also provided are beach towels, beach chairs, and beach toys (including boogie board, floats, and sand toys). There is an outdoor shower for washing off after a day at the beach. The Carriage House is complete with two flat screen TVs, a DVD/Blu-Ray player, a docking station, and wireless internet service. To simplify your trip, you will find kitchen supplies (coffee, spices, paper towels, dish detergent & dishwasher pods) and bath supplies (soaps, shampoo / conditioner, face wipes, toilet tissue) all provided in the unit. Having these extras means you can head straight out the door for fun rather than shopping for necessities! To book Twinkle you may contact owner Barbara Artman at 662-332-3489 for the best rates or you may book through VRBO – property 511724.